Representatives of the Holy Ascension Monastery in Detroit, where former auxiliary bishop of the Romanian Episcopate of the Orthodox Church in America Monk Irineu (Duvlea) served as abbot, has returned its antimension to the diocesan offices and asked to be released from the jurisdiction of the Romanian Orthodox Episcopate of America. As previously reported, Monk Irineu was deposed by a spiritual court held at St. Demetrius Orthodox Church in Jackson, MI, during the Holy Synod’s annual retreat, held this year June 19-23, and following a nearly two-year investigation by the Office for Review of Sexual Misconduct Allegations. 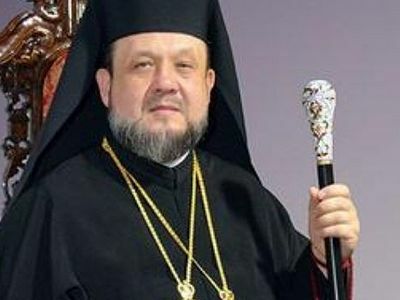 Primate of the OCA, His Beatitude Metropolitan Tikhon (Mollard) addressed a letter to the Romanian Episcopate, published on the site of the Orthodox Church in America, explaining that former-Bishop Irineu was being returned to the rank of a simple monk. The following day, Abp. Nathaniel released another letter, in which he informed the clergy of his diocese that the antimension of Holy Ascension Monastery had been returned by request of Monk Irineu on June 28 to the Chancery Office of the Episcopate. An antimension is a piece of cloth consecrated and signed by a bishop, to be placed on an Orthodox altar upon which the Divine Liturgy is served. It is forbidden to serve the Divine Liturgy without a canonical antimension. A letter was also given to the archbishop in which the monastic community asks to be released from the jurisdiction of the Romanian Episcopate. The archbishop’s letter does not indicate if they mentioned which jurisdiction they hope to join. The letter was signed by Monk Irineu and Archdeacon Sebastian (Dumitrascu), as well as Hieromonk Firmilian (Palosan) and Brother Florin (Cretu), who, according to the bishop, are neither members of the monastic community nor canonical clergy of the diocese, and Mrs. Stefana Romanov of the monastery’s Board of Trustees. Stating that he cannot recognize the Holy Synod’s decision, the deposed bishop signs his letter as if he were still a bishop: “With Archpastoral Blessings, + Irineu, Bishop of the Orthodox Church,” again showing his rebellion against the Synod. Further, a letter from Monk Irineu’s attorney Daniel P. Dalton has also been published on the monastery’s Facebook page, which argues that the case against the former bishop was a product of Abp. Nathaniel’s humiliation, frustration, and rage over former-Bishop Irineu’s popularity with the flock. “The hearing was clearly designed for you to fail,” the attorney writes, claiming that the Holy Synod ignored canon law. Furthermore, Dalton argues that three witnesses, former residents of the monastery, were unfit to testify as they themselves are sexual deviants. Given Monk Irineu’s disobedience and unwillingness to accept the canonical decision of the Holy Synod, Abp. Nathaniel directs his clergy and faithful to refrain from visiting the monastery until the situation is resolved, and calls upon them to pray for himself, Monk Irineu, and for one another in this difficult time. I waited a few days for things to settle and create a little peace after unjust decision of the Synod of the Orthodox Church in America (OCA) and the Romanian Orthodox Episcopate of America (ROEA) on my abusive and unfounded criminality. I also received with great bitterness and stupor the OCA and ROEA’s official release on the decision taken against me at the end of a so-called investigation that has also been subject to my suspension of my hierarchical ministry so far. Although the outcome of this research is so sad and unfair, although the investigation to which I was unjustly subjected was one that was obviously conducted from behind to lead to this result that we are facing today, I want to urge all of you to not lose your trust in JUSTICE! The tragedy is to be able to utter such nonsense as you do. What are you suggesting? Should the Church wait for the diriment word from a secular court about canonical matters? They hold every sin like a value to be defended strenuously, but don't mind..... noblesse, ehm, la dйmocratie oblige, parbleau! About "Vladika", don't worry, we have just another Puhalo in the making. But was he found guilty. It's all good and well saying that the synod has examined documents etc etc but has he been convicted of dilly dallying in an American court of law. We all know that it is a common theme in America to make statements of opinion (lies/half truths etc) that are never backed up by facts eg Iraq has WMD, Syria used chemical weapons etc. to suit their agendas. Same thing here. If these American Orthodox are going to start defrocking clergy, then we need clarity as to why they have taken such actions. Something is clearly rotten in the state of Denmark or in this case America. Truly a great although not unexpected tragedy. Spiritual courts are under a seal similar to that if confession; it is both uncanonical and sinful for the proceedings of a spiritual court to be made public by the Church and her clergy, as scandalous as that might seem to our democratic mindset. Just what we need another independent defrocked "bishop" starting yet another diocese out of rebellion,well if no one takes him is he going too start his own diocese and start his own churches?The Old Catholics are bad enough now we have renagades like this,yuck. One of the things I object to in these and other proceedings, is that often, we are not told why. Why was he removed? If we knew why, a lot of speculation about the facts would be cleared up. If he screwed around with a woman in his parish, tell us. If he mishandled money and took a vacation to Rio, tell us. I would say that most of us would be forgiving and kind if we knew why. No one escapes sin in this life. I am not saying we need to name names of those involved in the sin, but Bishops and Metropolitans should be held to a higher standard and if they sin canonically and do not repent, we should know WHY they have been removed.